Contents: Manual and workbook with multiple-choice test shipped to you. This course addresses some of the challenges involved in caring for people who are ill, injured or dying. It gives tools to help integrate your practice into hospitals, nursing facilities and home care settings. It includes topics such as ethical dilemmas, dissonance, mentorship and boundaries. It was very helpful to have the key vocabulary word glossary. It was also interesting and helpful to see the ANA code for nurses, being a massage therapist. This course is a must for someone new to working in a hospital/hospice situation. Information is easy to understand and testing was straight-forward. I have worked with hospice patients and this was a great review, I recommend to all massage therapists who might find themselves caring for an ill loved one or anyone. The course was very easy to read/understand. I like how you included studies. After 20 years of touch therapy, I was surprised to learn so much. Medical Settings is not my field but it has so much that I can and I will add to my practice. I learned so much info that I can carry on into my professional life. 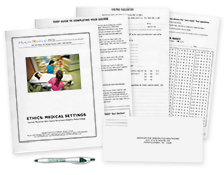 This course provided the information needed to work in the hospital environment. It included what to expect with patients and boosted my confidence of working in the hospital setting. This is a wonderful medical ethics course! It refreshed and increased my understanding of how to approach ill clients. I would recommend this class to anyone, even if you are not intending to practice hospital-based massage. I found this course a pleasure to do. It was given in a professional manner and I really enjoyed doing it. I wish I had had this guidance last year when I was the MT for a Parkinson's Disease Study. Much of the emotions I experienced would have been more easily understood. An excellent introduction into the care of ill/critically ill patients. I thought the course was informative and interesting. Health Positve is an excellent way to complete your CEUs. It allows you to take courses that provide interesting information on your schedule. The website is easy to navigate and puts all of the materials at your fingertips. I like the real-life situations that are listed. It makes me think how I would have reacted in that situation. Very Helpful! This was a thorough and convenient course to fulfill my ethics requirement. Very clear and understandable directions, easy to read. I enjoyed the information on Working in Illness Care Environments. I wish I had this training years ago...I would have benefited. I enjoyed the online availability of the course. Nice to be able to take the specific course I needed on my own time and at my own pace. The course was very well done and the answers were found straight forward in the book. I am going to recommend your Ethics course to the Administration at my massage school for other professionals like myself. I appreciated this course and its contents. I have worked in a nursing home for 5 years and I wish I would have had it prior to that. It gave me a better understanding for the physical and emotional needs of others. Thank you. I think this course was well thought out and a good refresher as far as ethical boundaries in different situations. Material was very informative and covered some important areas of concern I had. I am a MT in a hospital setting. It is hard to find CEU's for what I do. Thanks so much! Great review, Enjoyed the bulleted layout, easy to read. Very informative and helpful in the quidelines given for interacting with the extended family to healthcare pracictioners as well as the patient. This course gives a very thorough overview of preparation for working with hospital based clients. Course was clear, concise and very informative. I really appreciated the reference material and the cited studies. These will be very helpful. Thank you. Great information for practitioners just entering the field of medical massage, and a nice refresher course for those who have taken some time away. Excellent course easy to read and understand. This is the first computer based course I have taken as I feel I learn well from the classroom. I was pleasantly surprised by this course. I was allowed to take my time and felt I learned as I participated. It was no longer just something I had to do for credit but something I actually enjoyed doing. Thank you. This is an excellent course for any massage therapist who is planning to work in the hospital setting. Great course, well written and informative! There is a lot of information, which is good and must be read often to retain it. An amazing course with very informative material! I look forward to incorporating this new learned information into my massage practice as well as daily interactions with everyone; as being compassionate and empathetic is extremely important for all aspects of life. I am a massage therapist with my own business and a hospice volunteer. This course was very helpful for both. I appreciated the format. It was organized and the text flowed. I liked the tips and it was easy to go back to a topic to review. Excellent course, very helpful for when you start working in a medical setting. I have been working in a medical setting for three years and much of the course material was familiar to me. Well Done. I found this course to be extremely valuable and useful and I appreciate the ease with which I was able to complete the course and test. Thank you! Excellent course for not only those considering expanding their practice to health care facilities, but, for any seeking how to improve upon client communications. As a hospice volunteer and massage therapist the information served to reinforce key areas to for me to keep in mind when working in a hospital setting. It also served as a welcome reminder for self care in order to continue in this most important work. Thank you, I enjoyed this course. This course was very informative and I've gained a better understanding of ethical medical massage. This class gave detailed information on the physical, emotional, social, and hierarchical challenges inherent in doing massage in medical settings. The materials presented were very interesting and gave a good overview of what to expect in this type of work. I enjoyed the class! Great course - especially since I work at a hospice. Content of this course was easy to understand and presented in a way to keep me interested all the way to the end of it. Test followed along quite well to information presented. This was very helpful knowledge for both of my licenses. I have my LMP and NAR licenses and found the course to be helpful at looking at both aspects of my care for residents in a different manner. Learned a lot and will apply the knowledge to all ineraction with my clients as appropriate! The author did an excellent job of presenting the topic, making in interesting, giving first-hand experiences and excellent references and scientific studies. I was very impressed with this course and also thought the test represented a full scope of inquiry for the information presented. Thank you. I liked that I could print everything off and then go back and take the test on the computer. The content was very good. I have been working as a PTA, LMT for almost 10 years and this course seemed to apply more than past ethic courses have. loved ..loved..loved..the content of the course...so informative..glad i chose this course. Regarding way to approach the needs of my client and myself with my care and concern, I didnt know there were resources and now I have more knowledge on how to get help. Thank you so much and it was at my own pace. This course was very informative and easy to understand. I enjoyed it very much! It was great learning materials and was challenging. Great course. Wish there were more hospital based massage programs. As a rule I am not one to like to do things online. I guess that is the way the world is going. I hate sitting in front of a computer. This is a nice way to pace myself with my time by giving the option to print the materials out and work at my pace to get continuing education and return to the computer briefly to fill out the test and evaluation. Thanks for making it easier for me. I value the additional education. As a Massage Therapist who is also a Physical Therapist in an acute care hospital, I found the course content very relevant and informative.The ethics portion of this course is clearly presented and I look forward to reviewing it on an ongoing basis. This course was well written and presented, concise, well organized and easy to understand. The test questions were helpful in learning the information by keeping my attention in an orderly pattern rather than random. Thanks so much for this helpful and well supported ethics class that was more interesting than any others I’ve taken. I especially appreciated the inclusion of standards of practice documents and a vocabulary list. The sections that helped me personally the most were: Therapeutic Relationships; Hospitals; and Caring for People Who Are Dying. I work in the healthcare environment and feel that this course covers the emotional and physical understanding of what is required in the environment. This is a very good course. I learned so much, and will be able to use it in my practice. This was an outstanding course, more interesting than any ethics course I have ever taken. Being on Oncology Massage Therapist in a local hospital and working closely with Hospice as well as providing Palliative Care on location for end stage patients, so much of the content reinforced and applied directly to my work. Thank you for offering something this specialized in the category of ethics. I am a hospice volunteer massage therapist and this was so very helpful to me! I did not train with a hospice LMT and even with 9 years of experience at a massage clinic I had many questions that were answered in this training and learned so very much. I am also excited to join HBNM for support and practical tips. I had never heard of them until now. Thank you so very much! I love this work and it makes me feel much more confident in the medical setting! Enjoyed the course. Information was enlightening and learned a lot about the future of Massage care in my area. I am looking forward to being able to work with the seriously ill in my community and using the information attained in this course. First time using your company. Usually, I prefer on-site courses, but must admit this course was an unexpected pleasure. I found this course to be informative and easy to follow. Also, your staff (Emma) was extremely courteous and helpful in my questions to her. Great course. My first with the Institute for Integrative Healthcare. Excellent course for anyone wishing to follow the path of medical massage. This course was challenging and made you think. Too easy isn't good. This was great. This was a dynamite refresher course with useful information! I found the course content very interesting especially about Hospice content. I've completed the Hospice Volunteer training program and plan to do massage therapy for Hospice. The course was very interesting and practical- Just the information I needed to work in the medical settings. I feel very well informed about hospital and hospice massage work from this course. The text was obviously based on deep personal experience and knowledge, and the clinical studies provided excellent support for the effectiveness of massage in hospital settings. This course was very informative on caring for the elderly, sick, and dying. Great online course! Excellent presentation of the issues surrounding medical massage settings. Given my personal experience of practicing in various medical settings the class noted and discussed the issues surrounding working in different environments with sick patients in a clear, well-thought out manner. I loved this course! It was so incredibly informative. I have been wanting to do Hospice Massage as well as work somehow in a clinical setting. This course gave me an excellent foundation. My interest has been peaked and I have been able to narrow down my desires for a work environment because of the descriptions of different care setting. I have printed many pages to keep on hand and refer to. Identify the common ethical dilemmas that occur when working with people in illness care environments and the strategies to reduce or cope with ethical dissonance. Recognize appropriate ways to present yourself as a professional in hospitals, nursing facilities and home care settings. List the recommended modifications for providing skilled touch to ill or injured people, including the common contraindications. Identify the recommended approaches to working with people who are seriously ill or dying. Identify the most common areas for ischemia (pressure sores or decubiti) in immobile persons and the best therapeutic approaches for working with them. "How do we deal with transference? First, we do NOT point out to the client what we imagine his or her transference to be. Remember that transference is unconscious. It is arrogant to assume that we know what another person's unconscious motivations are. Our job is to set and maintain clear and consistent personal and professional boundaries, or limits, to be most therapeutic towards the client. When we recognize our own transference to the client, we may benefit from talking it over with a trusted professional peer. In fact, one of the best ways to prevent ethical mistakes is to have a regular and on-going relationship with another professional who can provide objective feedback to your practice experiences. Why wait until you are in the middle of a crisis to seek objectivity, when it can be an on-going part of your professional development? In addition to providing objectivity, professional peers can help us explore our ethics." This online class was perfect for me and my limited amount of time due to a crazy schudule. It allowed my to study when I had time and due the final when I was ready. I will take advantage of this in the future.